The watch face is fantastic and looks very professional and stylish, its large so stands out. The leather strap is very comfortable and obviously adjustable has a buckle. It goes well with most clothing especially if you wear brown leather jacket or shoes its perfect match, great accessory for styling. 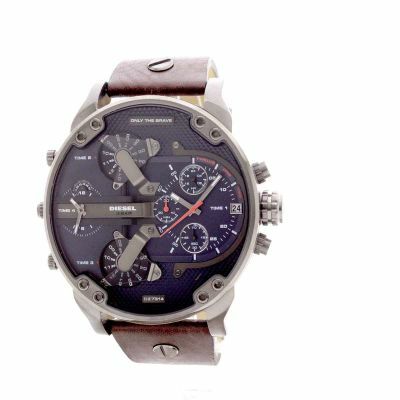 I would say tho that maybe also purchase a separate metal steel set of diesel straps as the leather will probably overtime wear out and break so a new strap would be necessary so a steel strap would be best any design would go well with the watch face and using the watch strap tool it can be changed which is great. 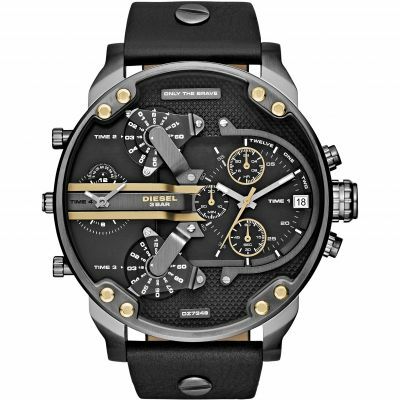 I would recommend purely as the watch face is amazing and compliments most steel wrist straps and leather strap for the time being is very complimentary and stylish and can be replaced with another leather strap set or metal steel strap which is what I recommend. 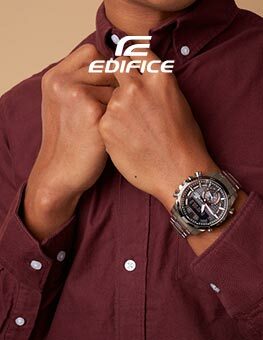 The watch face is big soits best to wear a jacket which would allow watch to be visible. Price is very good and its a very good valuable investment. I definitely recommend this as a first time or collection watch. 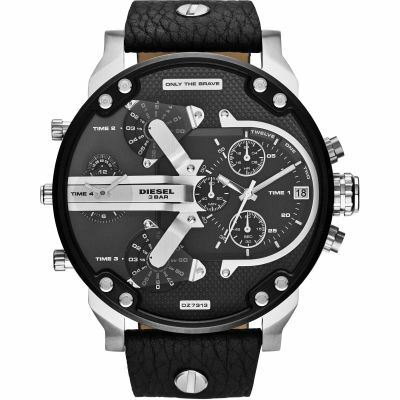 Stunning looking watch, the face is as big as your wrist. 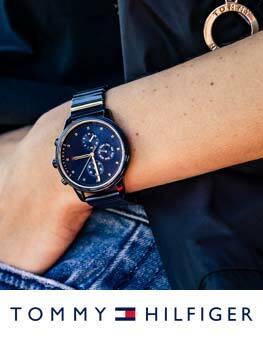 Its a watch that draws a lot of attention from people and its size feels good on the wrist. Sadly its not quite blue on the dial its a greyish tone and unlike other watches for this price it is only 30m water resistant but then these are really only minor things and when you get it out of the box you soon forget these things. I bought this as a present for my husband for Christmas the service from watch shop was exceptional from the second I placed my order right through to receiving it, as you can imagine my husband was absolutely made up with his new gift but unfortunately he discovered that it was faulty, Im not going to lie I was devastated as he was unable to show anyone his gift, but I can not fault watch shop for there customer service and support. I phoned the service team today with regards my return and I hope this exceptional customer service care continues and the problem solved as I look forward to ordering a new watch. Great watch, bought as a gift. Looks stunning on the wrist. Wow .what a excellent service and what an online company watchshop. com are. Everything what I wished for in my order a deisel dz7314 watch .fantastic service and prompt emails .definitely use you again perfect. Watch was brough for my dads birthday ! Was spot on! He loves it ! Watch is beautiful and exactly what was like the picture and write up ! 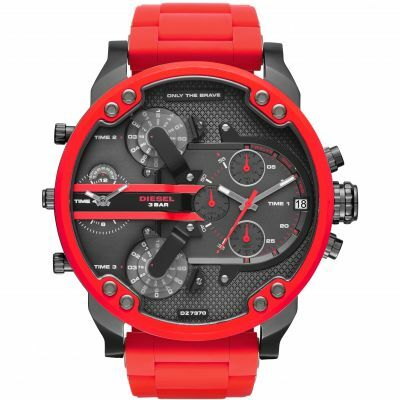 This watch will suit a person with a bigger wrist as it is a larger size face ! 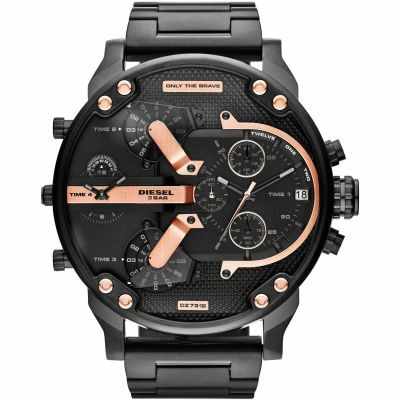 Watch shop its self, fab with Communication , pricing and delivery is super fast ! The delivery was delayed for one day due to security check issues with my credit card and hence received the gift day after his birthday. Easy to register and purchase product! Happy with speed of delivery to my nearest goldsmiths shop! Will definitely use again! As the gift came expertly gift wrapped in a beautiful wrap I cannot see the product until its opened Xmas day , but the service was informative and fast , if the product as good as the service Ill be extremely happy ! 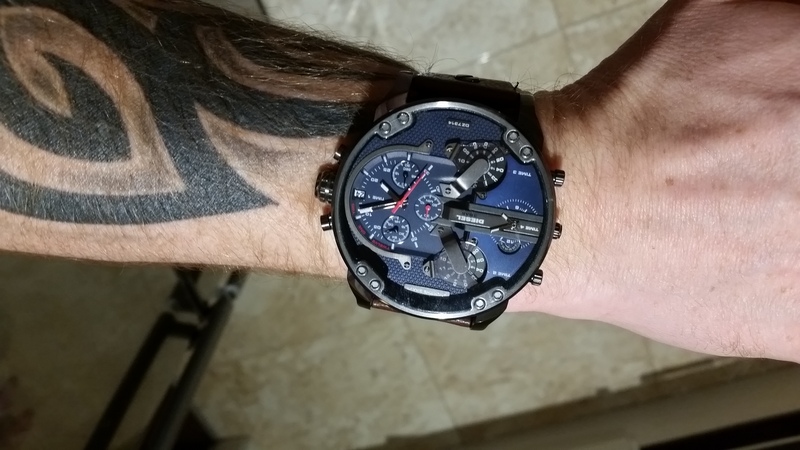 Well i absolutely love the watch and its very easy to set up, cant see how others struggle to work it out, if you have a bit of savvy about you its a doddle. The blue isnt quite as blue as the pictures suggest but its still a very dapper looking time piece. Would definitely recommend to my family and friends. 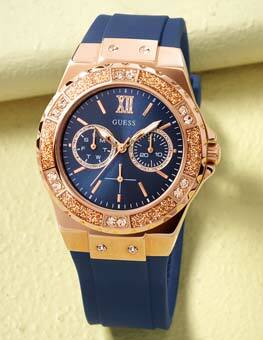 Very nice watch, I bought it for my husband. Can someone tell me were I can find how everything works? Watch face is bigger and better than expected. 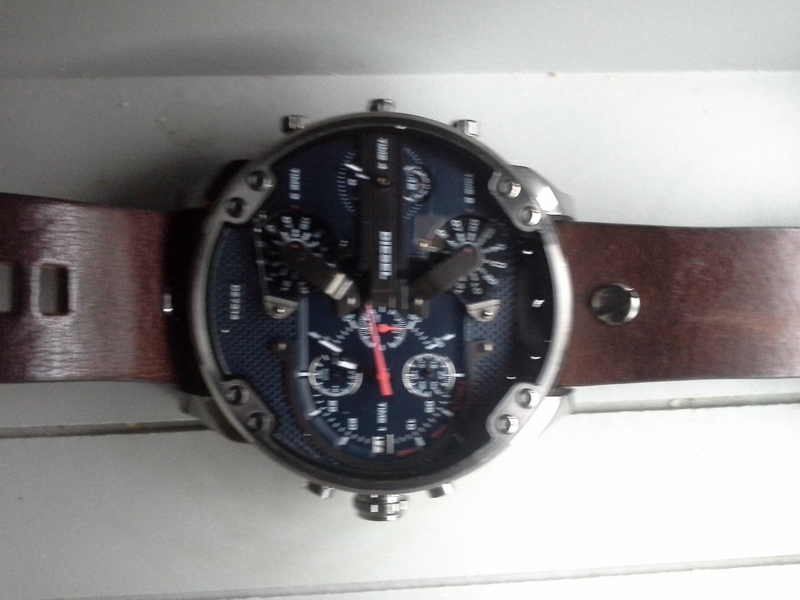 Flexible but solid leather strap.I wish colour on picture was accurate. Nearly did not order because of review which says slate grey face rather than blue shown. Would have been mistake as I prefer the actual colour to the picture. Very happy with purchase. 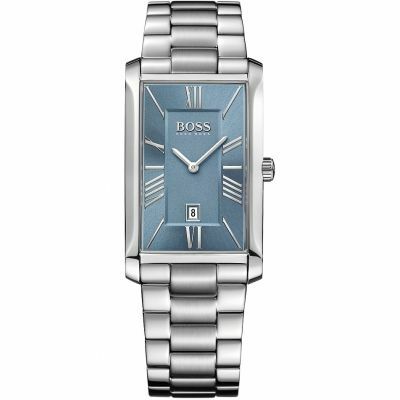 Purchase this watch for my husbands birthday. 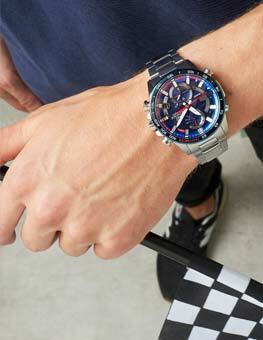 He was seeking to buy this watch for sometime and after seeing it on your website at a price cheaper than Diesel there was no hesitation but to order it. Without a doubt this ticks all the boxes. It is his personal piece of bling for the wrist! One very happy birthday boy. 2 The instruction manual sent with the watch has no reference to the DZ7314 at all & is generic, covering all the watches except DZ7314 - Maybe I was having a senior Grey moment :- it took me about 2 hours of searching the internet to find out how to operate it.